The International Conference on the Art, Science, and Engineering of Programming is a new conference focused on programming topics including the experience of programming. We have named it ‹Programming› for short. ‹Programming› seeks for papers that advance knowledge of programming on any relevant topic, including programming practice and experience. After Brussels, Nice, and Genova, this fourth edition will take place in Porto, Portugal, Mon 23 - Thu 26 March, 2020, a charming city that will embrace you as soon as you arrive! The main venue will be the Faculty of Engineering of University of Porto (FEUP, which has been promoting informatics engineering both in academia and industry. 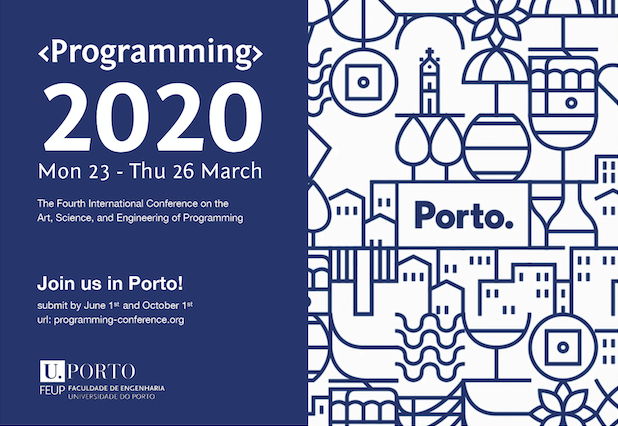 The program will provide an opportunity to sample some of Porto’s attractions, as well as local academy and industry, to promote informal and playful conversations about programming, and to make sure that your conference experience will be me-mo-ra-ble!